Hiscock was a native of Pompey, New York, and graduated from Pompey Academy. After studying law with his brother L. Harris Hiscock, he was admitted to the bar in 1855 and began to practice in the town of Tully. The Hiscock brothers later relocated to Syracuse, where the founded the firm that became known as Hiscock & Barclay. In addition to their law practice, the Hiscock brothers were active in politics. Frank Hiscock was opposed to slavery, and successively joined the Democratic, Free Soil, and Republican parties. He served as district attorney of Onondaga County from 1860 to 1863, and was a delegate to the 1867 state constitutional convention in 1867. In 1872 he was a supporter of the Liberal Republican Party and its nominee for president, Horace Greeley. In 1876, he was a delegate to the Republican National Convention. Hiscock was elected to the United States House of Representatives in 1876, and was reelected four times. He served in the House from March 4, 1877 to March 3, 1887, and resigned before the start of the term to which he had been reelected in 1886 because he was elected to the United States Senate in January 1887 for the term that started on March 4, 1887. Hiscock served one term, and after it expired on March 3, 1893 he returned to practicing law in Syracuse. Hiscock died in Syracuse on June 18, 1914, and was buried at Oakwood Cemetery in Syracuse. He was elected as a representative to the Forty-fifth and to the four succeeding Congresses and served from March 4, 1877 to March 3, 1887. He was chairman of the House Committee on Appropriations in the (Forty-seventh Congress). He was reelected in 1886 for the term starting March 4, 1887, but resigned in order to accept the U.S. Senate seat to which he had been elected in January, 1887. Hiscock was elected to the United States Senate by the New York State Legislature, defeating incumbent Warner Miller and Levi P. Morton in the Republican caucus and Democrat Smith M. Weed in the vote of the full legislature. 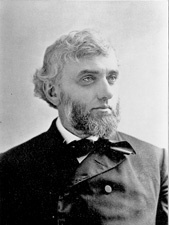 Hiscock served from March 4, 1887 to March 3, 1893, and was chairman of the Committee on Organization, Conduct, and Expenditures of Executive Departments (Fifty-first and Fifty-second Congresses). ^ "Ex-Senator Hiscock Dies In 80th Year". New York Times. June 19, 1914. ^ "Frank Hiscock Dies at Syracuse Home". Brooklyn Daily Eagle. Brooklyn, NY. June 18, 1914. p. 3.